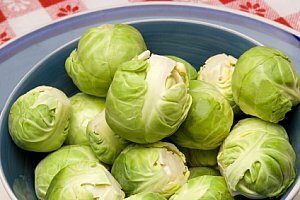 Brussel sprouts facts, an information sheet for kids cooking activities. Brussel sprouts facts and general information about brussel sprouts. They grow like their relatives cabbages and broccoli. Small heads sprout and are harvested. Brussel sprouts look like miniature cabbages. They should be heavy and tightly closed with no blemishes and no yellow color. Boil, fry, cook in a casserole or steam. My favorite way is to cut in half and place on a cookie sheet. Drizzle with olive oil and season with salt and pepper. Roast in a 450 degree oven for about 5 minutes or until tender. High in Vitamin K and Vitamin C. Brussel Sprouts are a cancer fighting vegetable. They are also high in folic acid and fiber. Bring a large pot of water to boil. Place Brussel sprouts in pot and continue to boil 3-5 minutes. Smaller sprouts =less time whereas larger sprouts should take more time. Dont overcook as they will lose their nutrition and flavor! Squeeze lemon and pour juice into bowl. Add other ingredients and pour over brussel sprouts. In a large skillet melt butter and sauté one garlic clove in butter. Cut Brussels Sprouts in half and place cut side down in the butter. Let cook 3-5 minutes until tender. Test the tenderness by sticking a knife in the sprout. It should be able to pierce through the sprout easily. Boil sweet potatoes in water. Cook until sweet potatoes are tender or you can insert a fork easily in a cube. Drain and set aside. 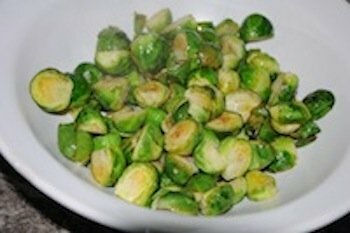 Cut Brussels sprouts in half and cook in boiling water about 5 minutes. Drain. In saucepan, adults can melt butter. Add cooked sweet potatoes, cooked Brussels sprouts and add remaining ingredients. Cook several minutes. Back to Food Facts from Brussel Sprouts facts.